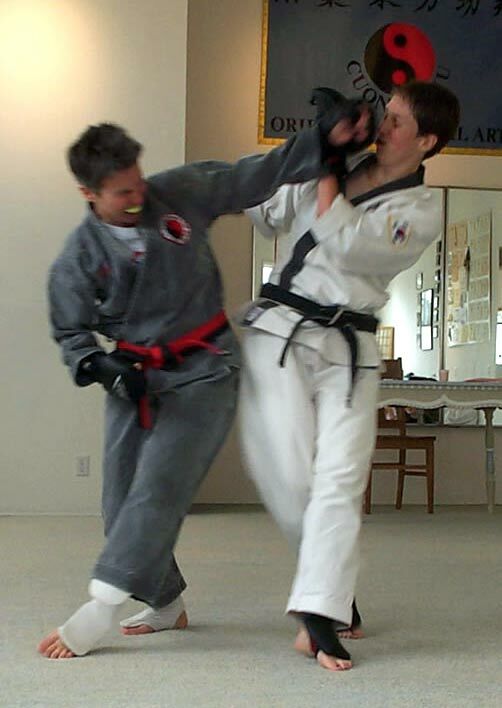 Many strong emotions come up in sparring — lots of fear, sometimes anger, joy, surprise, frustration, etc. — the emotions themselves are not a problem. In fact, they’re a source of energy. The problem is often the stories that we bring to sparring, or that come up in sparring, that have emotions and beliefs about ourselves attached. Stories like “I have to win” or “I can’t look bad” or “I’m lousy at this” or “I’m going to get hurt.” It’s the stories that freeze you up, take you out of the moment — that lead you to try to prove or disprove them, and doing that takes you out of relationship with your partner. If the stories stay unconscious, they can lead you to hit too hard, or run too far, to move in abject fear, or strike in anger. Then you’re not fighting your partner anymore, but with yourself, your past. They’re your stories, so they’ll always come up in some form, but you can learn to make some space around them, and free yourself up more to be in the moment. This also frees you up to access the power of the ground. The key is to focus your intent on being in the present and engaging your partner, with all your emotions, spirit, heart, intelligence and courage. When you and your partner are present and engaged, you can match and meet each other, play on your edge together. If you start a fight with the intent only to survive, then you’ll focus only on the fear and while you will survive, it won’t be that fun; if you start with the intent only to dominate your partner, you leave little room for spontaneity or new learning. But if you start with the intent to be present and engage, then a whole different fight can emerge. © Copyright 2015 Moon Dragon Dojo. All Rights Reserved.